Cystic fibrosis (CF) is one of the most common lethal genetic diseases in which the role of microRNAs has yet to be explored. Predicted to be regulated by miR-126, TOM1 (target of Myb1) has been shown to interact with Toll-interacting protein, forming a complex to regulate endosomal trafficking of ubiquitinated proteins. TOM1 has also been proposed as a negative regulator of IL-1β and TNF-α–induced signaling pathways. MiR-126 is highly expressed in the lung, and we now show for the first time differential expression of miR-126 in CF versus non-CF airway epithelial cells both in vitro and in vivo. MiR-126 downregulation in CF bronchial epithelial cells correlated with a significant upregulation of TOM1 mRNA, both in vitro and in vivo when compared with their non-CF counterparts. Introduction of synthetic pre–miR-126 inhibited luciferase activity in a reporter system containing the full length 3′-untranslated region of TOM1 and resulted in decreased TOM1 protein production in CF bronchial epithelial cells. Following stimulation with LPS or IL-1β, overexpression of TOM1 was found to downregulate NF-κB luciferase activity. Conversely, TOM1 knockdown resulted in a significant increase in NF-κB regulated IL-8 secretion. These data show that miR-126 is differentially regulated in CF versus non-CF airway epithelial cells and that TOM1 is a miR-126 target that may have an important role in regulating innate immune responses in the CF lung. To our knowledge, this study is the first to report of a role for TOM1 in the TLR2/4 signaling pathways and the first to describe microRNA involvement in CF. Cystic fibrosis (CF) is an inherited disorder characterized by chronic airway inflammation. Bronchial epithelial cells contribute significantly to the pulmonary inflammation evident in CF. LPS and IL-1β, which bind to TLR4 and the IL-1RI respectively, also play a pivotal role in this process. These agonists can activate the innate immune response culminating in proinflammatory gene expression leading to neutrophil-dominated airway inflammation and tissue damage in the CF lung. IL-1RI and TLRs are present on a variety of cell types, including both immune cells and epithelial cells within the lung. In the context of CF, airway epithelial cells have been shown to promote proinflammatory gene transcription following stimulation with their cognate agonists (1, 2). For example, in airway epithelial cells of non-CF and CF origin triacylated lipopeptide, LPS or unmethylated CpG DNA can induce IL-6, IL-8, and TNF-α production via TLRs 2, 4, and 9 (1). Similarly, IL-1β can upregulate production of a plethora of proinflammatory cytokines (2). Therefore, TLRs and their signaling intermediates represent potential therapeutic targets for CF. Despite significant advances in treatment regimes, CF remains a condition for which there is no effective cure. Therefore, investigating the expression and function of microRNAs (miRNAs) in CF will shed light on previously unidentified regulatory mechanisms controlling changes in gene expression and direct the development of future therapeutic strategies for this debilitating and fatal disorder. Expanding interest in miRNAs over the past decade has uncovered their importance in several biological processes and has identified disease states with altered miRNA expression patterns. miRNAs are 20–25 nucleotides long and negatively regulate gene expression at a posttranscriptional level. Within each miRNA there exists a 2–8-nucleotide seed region thought to be critical for target selection (3). Mature miRNAs use this seed region to bind selectively to miRNA recognition elements (MREs) within the 3′UTR of target mRNAs. Different target genes may have several MREs and therefore be regulated by numerous miRNAs. The number of and distance between MREs are considered important for the biological activity of miRNAs. Relatively few miRNAs have been studied in detail, and hence the biological relevance of the majority remains to be uncovered. Expression levels vary greatly among tissues, and it is believed that dysregulation of miRNA can contribute to pathologic disease (4). Therefore, we considered it plausible to investigate whether unique miRNA expression profiles exist in CF, particularly in CF bronchial epithelial cells, and explore their effects on influencing signaling pathways. We performed expression profiling comparing miRNA expression in CF and non-CF bronchial brushings. Based on these studies, we selected miR-126 for further investigation, given that its expression is known to be highest in vascularized tissues such as the lung, heart, and kidney (5–7), and as it has been shown to be present in bronchial epithelium (8). miR-126 is 21 nucleotides in length, located on chromosome 9q34.3 and is contained within intron 5 of its host gene epidermal growth factor like-7 (6, 9). In recent studies, miR-126 has been shown to have functional roles in angiogenesis (10, 11), to be downregulated in a number of malignancies (8, 12) and to act as a tumor suppressor in breast cancer (13). In silico analysis of a number of miRNA target prediction databases shows that TOM1 is a potential target of miR-126. TOM1 is a member of a family of proteins containing an N-terminal VHS (Vps27p/Hrs/STAM) domain reported to be involved in intracellular trafficking (14). Previous studies have shown that TOM1 forms a complex with Toll-interacting protein (Tollip), a negative regulator of TLR2, TLR4, and IL-1RI signaling. This complex regulates endosomal trafficking of ubiquitinated proteins (15). Moreover, this complex has been shown to traffic IL-1RI to the endosome for degradation (16). TOM1 has also been proposed as a negative regulator of IL-1β- and TNF-α–induced signaling pathways, whereby its overexpression can suppress the activity of the transcription factors NF-κB and AP-1 (17). In this study, we explore the presence of miRNA in CF for the first time. We investigate the expression of miR-126 in CF and non-CF airway epithelial cells both in vitro and in vivo by quantitative real-time PCR (qRT-PCR) and miRNA expression profiling, and we explore the potential mechanism responsible for altered miRNA expression in CF bronchial epithelium. We determine whether TOM1 is a valid target of miR-126, as predicted by in silico analysis, and further investigate the role of TOM1 in IL-1β, LPS and lipopeptide-mediated airway inflammation in the CF lung using over-expression and knockdown approaches. All cell lines were maintained in a 37°C, humidified CO2 incubator in appropriate media. 16HBE14o– and 9HTEo– (human bronchial and tracheal epithelial cell lines, respectively), CFBE41o– and CFTE29o– (human ∆F508 homozygote bronchial and tracheal epithelial cell lines, respectively) were obtained as a gift from D. Gruenert (California Pacific Medical Center Research Institute, San Francisco, CA). HepG2 (human hepatocellular liver carcinoma cell line), HEK293 (human embryonic kidney cell line), A549 (type II-like human lung epithelial cell line), THP-1 (human acute monocytic leukemia cell line), U937 (monocytic cell line), and U373 MG (human glioblastoma-astrocytoma, epithelial-like cell line) were obtained from the European Collection of Cell Cultures (Salisbury, U.K.) Prior to agonist treatment, cells were washed with serum-free media and placed in media containing 1% FCS for Pseudomonas aeruginosa LPS (Sigma-Aldrich, St. Louis, MO), IL-1β (R&D Systems, Minneapolis, MN), flagellin (Alexis Biochemicals, Farmingdale, NY), triacylated lipopeptide (palmitoyl-Cys[(RS)-2,3-di(palmitoyloxy)-propyl]-Ala-Gly-OH, Pam3; Bachem, Torrance, CA), unmethylated CpG DNA (uCpG 5′-TCGTCGTTTTGTCGTT-3′) (MWG) and poly:IC (Sigma-Aldrich) stimulation experiments. Nineteen individuals were recruited into this study; six had CF (confirmed by sweat testing and/or genotyping) and thirteen were non-CF controls, with a mean age of 22.8 ± 1.6 y and 51 ± 4.2 y, respectively. For expression profiling studies, five individuals with CF (three male and two female) and five non-CF controls (four male and one female) were selected from the study group. All participants (CF and controls) were undergoing diagnostic and/or therapeutic fiber-optic flexible bronchoscopy as part of routine care. Fully informed consent was obtained before the procedure, and appropriate approval was obtained from our institutional review board. After completion of the bronchoscopy and before the withdrawal of the bronchoscope, an area 2 cm distal to the carina (medially located) in either the right or left main bronchus was selected and washed twice with 10 ml sterile 0.9% NaCl. Next, a sterile 10 × 1.2-mm bronchial brush (Olympus Medical Systems, Tokyo, Japan) was inserted through the appropriate port on the bronchoscope and the chosen area sampled with two consecutive brushes by scraping the area gently. The brush was withdrawn and immediately placed in 5 ml MEM+Glutamax supplemented with 10% FCS and 1% penicillin-streptomycin (Life Technologies, Carlsbad, CA). Brushes were gently agitated to dislodge cells into the media, which was centrifuged at 1200 rpm for 5 min, and cell pellets resuspended in 0.5 ml Tri Reagent (Sigma-Aldrich) before RNA extraction. MiRNA expression profiling was performed in bronchial brushings (CF, n = 5; non-CF, n = 5) by a stem-loop, real-time PCR-based miRNA expression profiling method using the Taqman MicroRNA Arrays v2.0 (released June 2009) from Applied Biosystems (Foster City, CA). The content is derived from the miRBase (microRNA database) miRNA registry, providing comprehensive coverage of miRNAs from release 10.0, using the most up-to-date TaqMan MicroRNA Assays. Two array cards (A and B) for each sample were run on the Applied Biosystems 7900HT fast real time PCR system, which measured expression levels of 667 different human miRNAs in each sample and three positive and one negative control per card. RNA (30 ng) from clinical samples was reverse transcribed with the Megaplex primer pool (Applied Biosystems), allowing simultaneous reverse transcription of 430 miRNAs and 36 endogenous controls in one RT pool (18). A preamplification step was performed on the Megaplex RT product (5 μl) using TaqMan PreAmp Master Mix (2×) and PreAmp Primer Mix (5×; Applied Biosystems). The PreAmp primer pool contained forward primers specific for each miRNA and a universal reverse primer (Applied Biosystems). All miRNAs with cycle threshold (Ct) values >35 were considered nonamplified or not expressed and were excluded from analysis. Mean normalization was performed by subtracting the mean sample Ct from the individual miRNA Ct values (19). Relative quantification of gene expression was determined using the comparative Ct method [2(−ΔΔCt)] as previously described (20). In the case of the non-CF samples, the mean Ct value was calculated for each individual miRNA, and this was used to calculate the ΔCt for the calibrator sample. Array data have been deposited in the National Center for Biotechnology Information Gene Expression Omnibus (21) and are accessible through Gene Expression Omnibus Series accession number GSE19431 (www.ncbi.nlm.nih.gov/geo/query/acc.cgi?acc=GSE19431). MiR-126 expression was measured using Taqman miRNA assays (Applied Biosystems) according to the manufacturer’s instructions, and qRT-PCR was performed on the Roche LC480 Lightcycler. The expression of miR-126 relative to miR-16 was determined using the 2(−ΔΔCt) method. All qRT-PCR experiments were performed in triplicate, including no-template controls. 16HBE14o– and CFBE41o– cells (1 × 105 in triplicate) were left untreated or treated with LPS (10 μg/ml) or IL-1β (10 ng/ml) for 3, 6, and 24 h, after which miR-126 expression was measured by qRT-PCR as described above. 16HBE14o– cells (1 × 105 in triplicate) were treated with thapsigargin (1 μM; a pharmacologic endoplasmic reticulum [ER] stress inducer) or CFTRinh-172 (5 μM and 10 μM) for 4 h and 24 h, (all reagents were purchased from Sigma-Aldrich). DMSO was the vehicle control. RNA was isolated and miR-126 expression was assessed by qRT-PCR. In silico analysis of a range of miRNA target prediction databases was performed, namely, TargetScan 4.2, picTar, PITA, RNA Hybrid, RNA22 and microRNA target detection software (miRANDA). TOM1 was a predicted target of miR-126 in all databases but miRANDA. Tollip was listed as a predicted target of PITA and RNA 22 only. Total RNA was extracted using Tri Reagent, equal quantities of which were reverse transcribed into cDNA using Quantitect Reverse Transcription Kit (Qiagen, Valencia, CA) following the manufacturer’s protocol. Primers for TOM1, Tollip, and β-actin were obtained from MWG Eurofins Genetics (TOM1-F 5′-ATTCTGTGGGCACTGACTCC-3′ and TOM1-R 5′-CACTCACCATCTCCAGCTCA-3′, β-actin-F 5′-GGACTTCGAGCAAGAGATGG-3′ and β-actin-R 5′-AGGAAGGAAGGCTGGAAGAG-3′, TOLLIP-F 5′-CAAGGTGGAGGACAAGTGGT-3′, TOLLIP-R 5′-ACATGTCCTGGATGGCTTTC-3′). Expression of TOM1 or Tollip relative to β-actin was determined using the 2(−ΔΔCt) method. All qRT-PCR experiments were performed in triplicate, including no-template controls. The full length 3′UTR of TOM1 was PCR amplified using a proof reading Phusion flash High-Fidelity PCR master mix (Finnzymes, Espoo, Finland) with the following primers TOM1 3′UTR-F 5′-CTGCTCTCACACCCTTAGGC-3′ and TOM1 3′UTR-R 5′-TGCTAGCAGGGTGGTTTTCT-3′. The amplified 740-bp product was inserted into the HindIII and SpeI sites of the miRNA expression vector pMIR-REPORT (Applied Biosystems) immediately downstream of the luciferase gene and termed pMIR-TOM1-3′UTR. Transformants were validated by restriction mapping and sequencing (MWG Eurofins Genetics, Ebersberg, Germany). HEK293 cells (1 × 105 in triplicate) were transiently transfected with 250 ng pMIR-TOM1-3′UTR and 100 ng of reference Renilla luciferase reporter plasmid pRLSV40. Cells were cotransfected with either 30 nM synthetic pre–miR-126 or a scrambled control. Transfections were performed using Genejuice (Novagen, Madison, WI) for plasmid DNA and Ribojuice (Novagen) for small interfering RNA (siRNA) in OptiMEM reduced serum media (Life Technologies) per the recommended conditions. Lysates were prepared 24 h after transfection and assayed for both firefly and Renilla luciferase using Luciferase assay system (Promega, Madison, WI) and coelenterazine (Marker Gene Technologies, Eugene, OR), respectively. Firefly luciferase activity was normalized to the Renilla luciferase activity. CFBE41o– cells (1 × 105 in triplicate) were left nontransfected (NT) or reverse transfected with either 30 nM of a scrambled control or synthetic premiR-126 using NeoFX transfection reagent (Applied Biosystems). Twenty-four hours after transfection, cells were washed with PBS, and whole cell lysates were prepared and separated by electrophoresis on a 10% SDS-polyacrylamide gel. Nitrocellulose membranes (Sigma-Aldrich) were probed using a mouse mAb to TOM1 (Abcam, Cambridge, U.K.) and a rabbit polyclonal β-actin Ab as a loading control (Abcam). Signals were detected using the appropriate HRP-conjugated secondary Abs (Cell Signaling Technologies, Beverly, MA) and visualized by chemiluminescence (Pierce, Rockford, IL) on the Syngene G:Box chemi XL gel documentation system. Membranes were analyzed by densitometry using GeneTools software on the same system. CFBE41o– cells (6 × 104 in triplicate) were cotransfected for 48 h (Genejuice) with 250 ng pCDNA3 (empty vector) or a TOM1 overexpression plasmid pTOM1-Myc (a gift from Dr. K. Nakayma, Kyoto University, Kyoto, Japan), and 100 ng of an inducible (NF-κB)5-promoter (firefly) luciferase reporter plasmid and 100 ng of the constitutive Renilla luciferase reporter plasmid pRLSV40. Forty-two hours after transfection cells were treated with LPS (1 μg/ml) or IL-1β (10 ng/ml) for a further 6 h. Lysates were prepared and assayed for both firefly and Renilla luciferase as described above. CFBE41o– cells (1 × 105 in triplicate) were left untreated or transfected with either 30 nM of an siRNA to TOM1 (siRNA ID 137971 5′-CCUCUUGGUUGAUCCUCUUtt-3′ Sense, 5′-AAGAGGAUCAACCAAGAGGtg-3′ Antisense), GAPDH (positive control, Silencer GAPDH siRNA (Human) Part Number AM4605) or a scrambled control (Scr; Silencer Negative Control #1 siRNA Part Number AM4611) siRNA (Applied Biosystems) using Ribojuice according to the manufacturer’s instructions. Twenty-four hours after transfection, cells were stimulated with LPS (10 μg/ml), IL-1β (10 ng/ml), triacylated lipopeptide (palmitoyl-Cys[(RS)-2,3-di(palmitoyloxy)-propyl]-Ala-Gly-OH, Pam3; 10 μg/ml), flagellin (1μg/ml) or poly:IC (100 μg/ml) for 6 h and uCpG DNA (100 μg/ml) for 24 h. Supernatants and cells were collected for ELISA and RNA extraction, respectively. SiRNA transfection was also performed (3 × 105 cells in triplicate) for protein analysis. Cells were lysed 24 h after transfection and Western blot analysis was performed as described above. IL-8 protein concentrations in the cell supernatants were determined by sandwich ELISA (R&D Systems). All analyses were performed using GraphPad PRISM 4.0 software package (San Diego, CA). Results are expressed as the mean ± SEM and were compared by Student t test (nonparametric, one-tailed) or ANOVA as appropriate. Differences were considered significant at p ≤ 0.05. Profiling to examine the expression of 667 different human miRNAs was performed on bronchial brushings (CF, n = 5; non-CF, n = 5) using TaqMan low-density arrays v2.0. Of the 667 miRNA examined, no appreciable target detection (Ct > 35) occurred for 263 miRNA across all samples. Ninety-three miRNAs were significantly differentially expressed (1.5 ≥ RQ ≤ 0.7) in at least three of five patients with CF. Of these, 56 were downregulated and 36 were upregulated (Supplemental Table 1). MiR-126 was found to be significantly decreased in four of the five CF samples compared with controls (p = 0.0143; Fig. 1A). MiR-16 and miR-491-5p were not significantly decreased or increased in CF versus non-CF samples. We independently confirmed this observation by measuring miR-126 expression by qRT-PCR (CF, n = 6; non-CF, n = 13), where miR-126 was again significantly decreased in CF compared with non-CF controls (p = 0.0037; Fig. 1B). MiRNA expression profiling and miR-126 expression in vivo. A, Expression levels of miR-126, miR-16, and mir-491-5p in bronchial brushings used in TaqMan low-density arrays (CF, n = 5; control, n = 5). Data are represented as fold change compared with normalized controls. B, MiR-126 expression in bronchial brushings from individuals with and without CF (n = 6 and n = 13, respectively) measured by qRT-PCR. Relative expression levels determined by qRT-PCR were normalized to miR-16. Data are represented as mean ± SEM and were compared by t test. All qRT-PCR experiments were performed in triplicate and included no-template controls. We next investigated whether miR-126 was differentially expressed in CF versus non-CF airway epithelial cell lines and again performed qRT-PCR on CF tracheal (Fig. 2A) and bronchial epithelial cell lines (Fig. 2B) and their non-CF counterparts. This investigation revealed that miR-126 was downregulated in CF compared with non-CF cells and significantly so in bronchial epithelial cells (p = 0.05), which we continued to use for the rest of the study. We also determined miR-126 levels in a variety of cell lines by qRT-PCR and, consistent with other reports, observed higher expression of miR-126 in lung airway epithelial versus nonlung cells (Fig. 2C). MiR-126 expression in vitro. 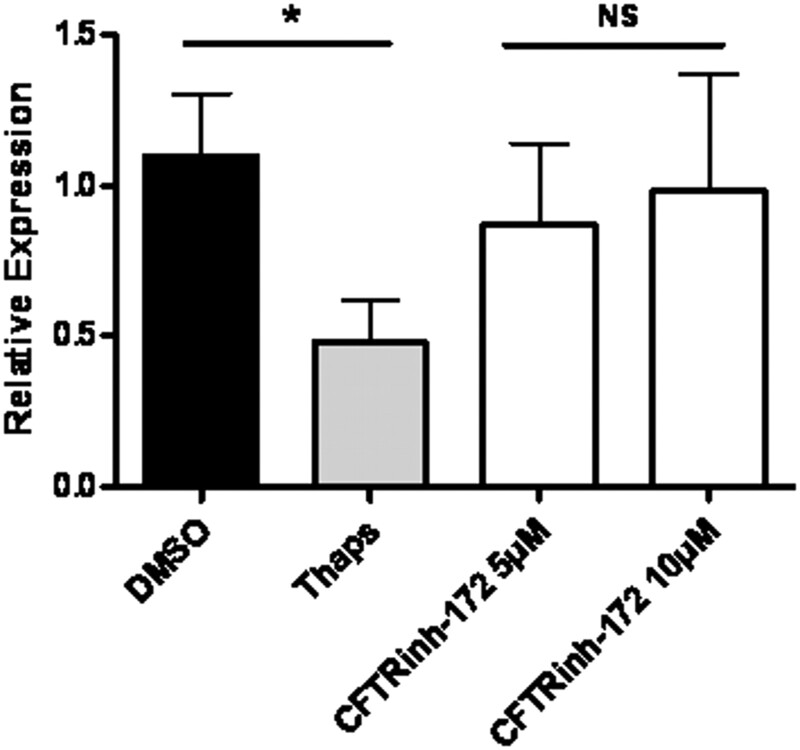 A, MiR-126 expression levels were assessed in the CF tracheal airway epithelial cell line CFTE29o– compared with its non-CF counterpart 9HTEo–, (B) in the CF bronchial epithelial cell line CFBE41o– compared with its non-CF counterpart 16HBE14o–, and (C) in the bronchial airway epithelial cell line 16HBE14o– and non-lung cell lines THP-1, U937, HEK293, HepG2, and U373. The relative expression levels were determined by qRT-PCR using Taqman miRNA assays and normalized to miR-16. Data are represented as mean ± SEM and were compared by t test. All qRT-PCR experiments were performed in triplicate and included no-template controls. We then attempted to address the mechanism responsible for reduced miR-126 levels in CF epithelial cells by inducing either ER stress or defective chloride ion channel secretion in 16HBE14o– cells using thapsigargin or CFTRinh-172, respectively. After 4-h treatments, there were no significant changes in miR-126 expression (data not shown); however, 24 h after treatment, miR-126 was significantly reduced (p = 0.0296) by the ER stress inducing agent (Fig. 3). There was no change observed in cells treated with the CF transmembrane conductance regulator (CFTR) inhibitor. We also examined the effects of LPS and IL-1β on miR-126 expression in both 16HBE14o– and CFBE41o– and found no effect (data not shown). MiR-126 regulation by ER stress. 16HBE14o– cells were treated with DMSO (vehicle control), thapsigargin (1 μM), or CFTRinh-172 (5 and 10 μM) for 24 h. Data are represented as mean ± SEM and were compared by t test; data are representative of three experiments. To identify potential targets of miR-126 both for experimental validation and functional studies in airway inflammation, we performed in silico analysis of a range of miRNA target prediction databases. From the databases analyzed, all presented TOM1 as a target of miR-126, with the exception of miRANDA. RNA hybrid provided a schematic of miR-126 predicted binding within the TOM1 3′UTR showing a minimum free energy of −21.5kcal/mol (Fig. 4A). Notably, Targetscan 4.2 illustrated the predicted pairing region in the TOM1 3′UTR to be conserved across species (Fig. 4B). We initially confirmed TOM1 expression in CFTE29o–, 16HBE14o–, CFBE41o–, 9HTEo–, and human lung RNA by semiquantitative RT-PCR (Fig. 4C). 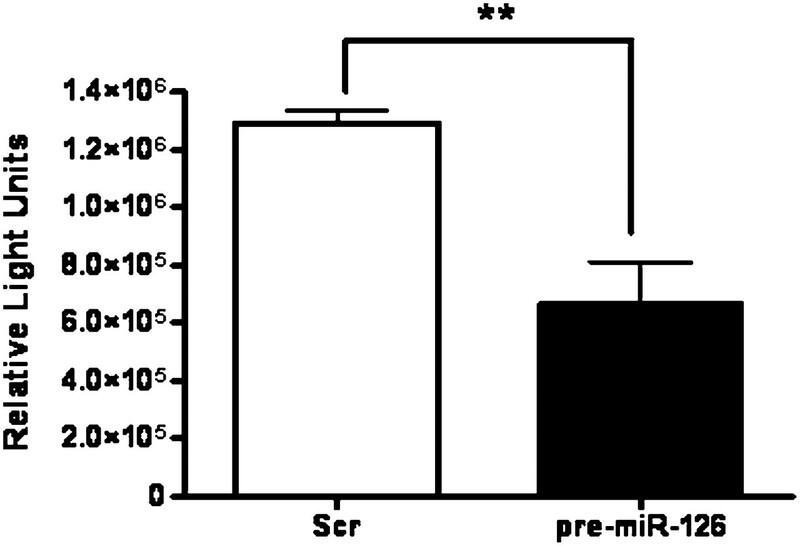 TOM1 expression relative to β-actin was then determined in CFBE41o– versus 16HBE14o– cell lines by qRT-PCR resulting in reciprocal levels (p = 0.05) compared with miR-126 in these cells (Fig. 1C), and again this observation was confirmed in vivo in four of the five bronchial brushings from CF versus non-CF individuals (p = 0.0143; Fig. 4D). The same databases were interrogated to assess whether Tollip is also a potential miR-126 target. Both PITA and RNA 22, but none of the other databases listed Tollip as a target. Therefore, we examined Tollip mRNA expression in CFBE41o– versus 16HBE14o– cell lines by qRT-PCR. Fig. 4E demonstrates reduced expression of Tollip in CF compared with non-CF cells (p = 0.0286). MiR-126 targets the 3′UTR of TOM1. A, In silico analysis of the miRNA target prediction database RNA hybrid shows predicted pairing between TOM1 3′UTR and miR-126. The 7-mer seed region is shown between the black arrows. B, Highly conserved predicted binding site for miR-126 within the 3′-UTR of TOM1 from interrogation of the Targetscan target prediction database (version 4.2). C, TOM1 mRNA expression in CFTE29o–, 16HBE14o–, CFBE41o–, 9HTEo–, human lung RNA (Applied Biosystems) and no-template control assessed by semiquantitative RT-PCR. D, TOM1 expression (both in vitro and in vivo), relative to β-actin in CFBE41o– versus 16HBE14o– cell lines and CF versus non-CF bronchial brushings measured by qRT-PCR. E, Tollip expression relative to β-actin in CFBE41o– versus 16HBE14o– cell lines measured by qRT-PCR. Mm, Mus musculus; NTC, no-template control; Rn, Rattus norvicus; Cf, Canis familiaris; Hs, Homo sapiens. To determine whether TOM1 is a molecular target of miR-126, we constructed a luciferase reporter vector containing the full-length TOM1 3′-UTR (pMIR-TOM1-3′UTR). The sequenced transformant showed 100% base pair match to the TOM1 3′UTR and importantly maintained an intact miR-126 binding region. HEK293 cells, which exhibit low levels of miR-126 expression, were used for transient transfections with pMIR-TOM1-3′UTR. Cotransfection with pre–miR-126 (a synthetic miR-126 mimic) resulted in a significant decrease in luciferase gene expression from the reporter vector containing the TOM1 3′-UTR when compared with a scrambled control (Fig. 5) demonstrating direct targeting by miR-126 (p = 0.0011). MiR-126 directly targets TOM1. Relative luciferase activity in HEK293 cells (1 × 105 in triplicate) transiently transfected with pMIR-TOM1-3′UTR and pRLSV40 and cotransfected with a synthetic pre–miR-126. Firefly luciferase activity was normalized to the Renilla luciferase activity. Data are represented as mean ± SEM and were compared by t test; data are representative of three experiments. All qRT-PCR experiments were performed in triplicate and included no-template controls. 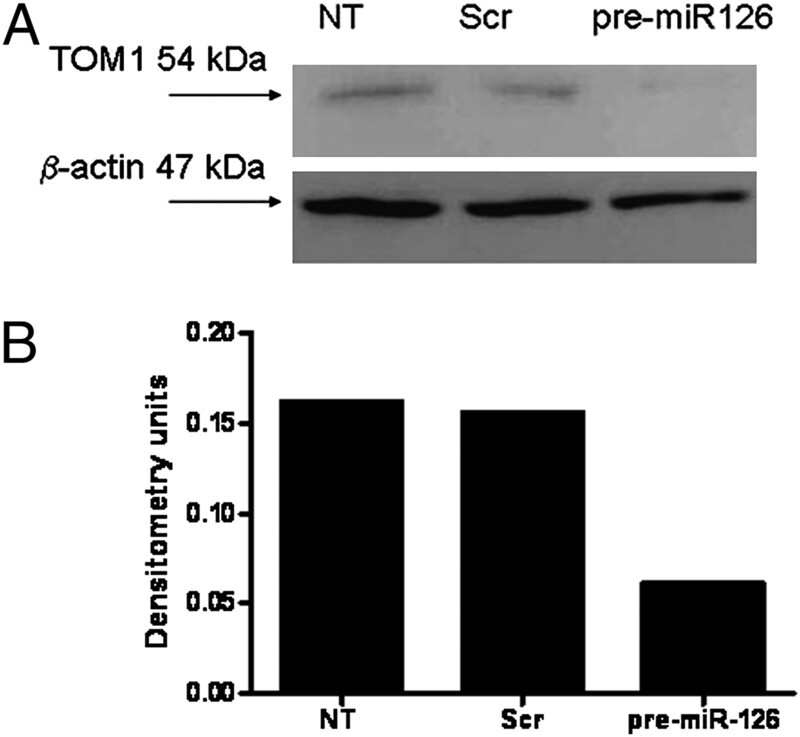 We next assessed the effect of miR-126 over-expression on TOM1 protein. Transfection of pre–miR-126 into CFBE41o– cells resulted in a significant increase in miR-126 expression compared with nontransfected or scrambled-transfected cells, as measured by qRT-PCR (data not shown). 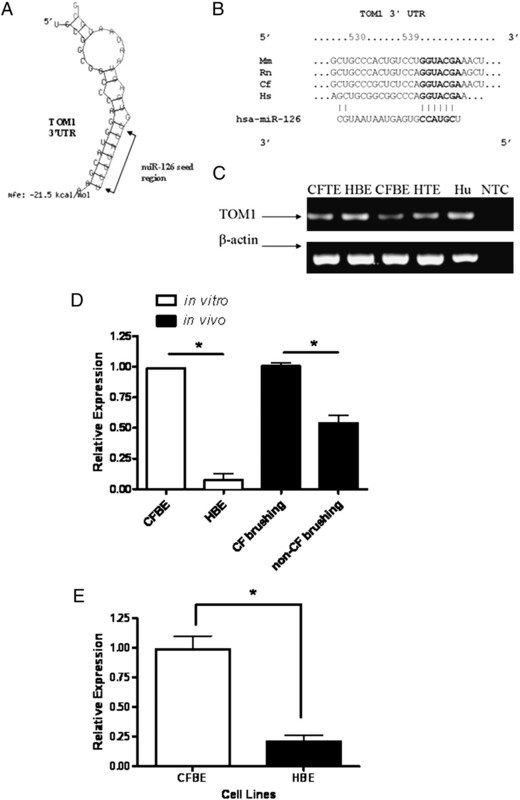 Subsequent Western blot analysis of TOM1 in CFBE41o– cells showed that miR-126 overexpression caused a reduction in TOM1 protein production compared with nontransfected (NT) cells or cells transfected with a Scr (Fig. 6A). Representative densitometry for Western blots is shown (Fig. 6B). Effects of pre–miR-126 overexpression. A, TOM1 protein was analyzed by Western blot (n = 3) using anti-TOM1 and anti–β-actin Abs in cell lysates from nontransfected control (NT), Scr, and pre–miR126 transfected CFBE41o– cells. B, Representative densitometry of TOM1 relative to β-actin. To determine functional effects of TOM1 in the context of the CF lung, we transfected CFBE41o– cells with a TOM1 overexpression plasmid, pTOM1-Myc, and assessed its effects on NF-κB activity in these cells in response to inflammatory stimuli common in the CF lung utilizing an NF-κB reporter system. NF-κB reporter gene expression in CFBE41o– cells was measured in response to stimulation with LPS or IL-1β for 6 h. Each of the agonists significantly increased NF-κB reporter gene expression (*p = 0.05) compared with controls, whereas overexpression of TOM1 inhibited this effect (#p = 0.05; Fig. 7). Effects of TOM1 overexpression. CFBE41o– cells (1 × 105 in triplicate) were cotransfected with an empty vector (pCDNA3) or a TOM1 overexpression plasmid (pTOM1-Myc), an inducible NF-κB (firefly) luciferase reporter plasmid, and pRLSV40. After incubation for 42 h, cells were stimulated with LPS (1 μg/ml) or IL-1β (10 ng/ml) for 6 h. Lysates were prepared using reporter lysis buffer (Promega). Luciferase production from both plasmids was quantified by luminometry using specific substrates. Relative NF-κB luciferase activity is shown. Data shown are representative of three experiments. 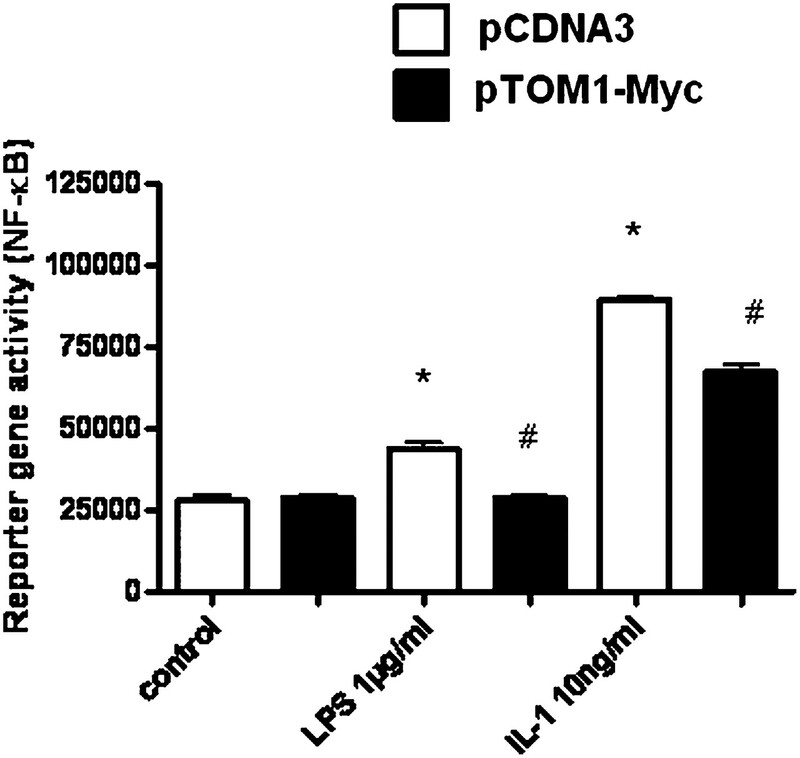 *p < 0.05, LPS/IL-1β versus control (pCDNA3); #p < 0.05, LPS and IL-1β versus pTOM1-Myc. IL-8 is an NF-κB regulated gene and a key cytokine present in the CF lung. We assessed the effect of TOM1 knockdown on IL-8 protein production in CFBE41o– cells in response to a range of proinflammatory stimuli, namely lipopeptide, poly:IC, LPS, flagellin, uCpG DNA, or IL-1β whose cognate receptors are TLR2, TLR3, TLR4, TLR5, TLR9, and IL-1RI, respectively. 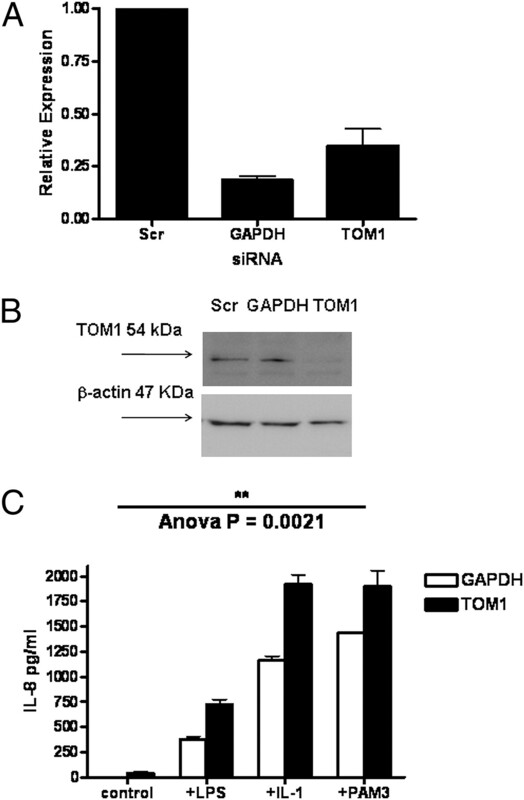 Cells transiently transfected with a GAPDH or TOM1 siRNA resulted in 80% and 65% knockdown, respectively, when compared with a scrambled control (Fig. 8A). Transfection efficiency was normalized to GAPDH gene expression. Knockdown of TOM1 resulted in a 20–50% decrease of TOM1 protein as determined by Western blot (representative blot shown in Fig. 8B). IL-8 protein production in CFBE41o– was measured in response to stimulation with LPS or IL-1β, lipopeptide, flagellin or poly:IC for 6 h and uCpG DNA for 24 h. LPS, IL-1β, and lipopeptide significantly increased IL-8 protein production (p < 0.05) compared with untreated cells (data not shown) and also in the presence of GAPDH siRNA (Fig. 8C). TOM1 knockdown in these cells potentiated the stimulatory effects of LPS, IL-1β, and lipopeptide with IL-8 secretion significantly increased in these cells (Fig. 8C). TOM1 knockdown did not enhance IL-8 secretion after treatment with flagellin, poly:IC or uCpG DNA (data not shown). Effects of TOM1 knockdown. A, Expression of GAPDH and TOM1 mRNA levels relative to Scr following transfection of CFBE41o– cells with scrambled, GAPDH, or TOM1 siRNAs. B, TOM1 protein was analyzed by Western blot (n = 3) using anti-TOM1 and anti–β-actin Abs following transfection of CFBE41o– cells with scrambled, GAPDH, or TOM1 siRNAs. C, Cells were stimulated with LPS (10 μg/ml), IL-1β (10 ng/ml), or lipopeptide (Pam3, 10 μg/ml) 24 h after transfection for an additional 6 h. IL-8 secretion in supernatants was measured by ELISA. Data are represented as mean ± SEM and were compared by t test; data are representative of three experiments. This study is the first to provide evidence for differential expression of a known miRNA in CF versus non-CF airway epithelial cells, and our data support the emerging body of evidence implicating miRNAs in innate immunity. Having established that expression of miR-126 is downregulated in CF versus non-CF airway epithelial cells in vivo by miRNA expression profiling and qRT-PCR of bronchial brushings obtained from CF individuals and non-CF controls, we replicated this observation in vitro using CF airway epithelial cell lines. We also observed miR-126 to be markedly increased in lung versus non-lung cell lines, consistent with other reports (6, 22). Using bioinformatic tools, targets of miR-126 were identified and TOM1 was selected for experimental validation, given its known role in the innate immune response (17). Because of the consensus that a target predicted by a combination of algorithms may have more functional relevance than those predicted using a single algorithm alone, we analyzed a range of databases (23). TOM1 was listed as a predicted target in five of six of the target prediction databases interrogated. In this study, we have experimentally validated TOM1 as a target of miR-126 by showing that overexpression of pre–miR-126 results in a decrease of TOM1 protein production and reduced luciferase activity in a reporter system containing the full length TOM1 3′UTR, demonstrating direct targeting by miR-126. We also present a functional role for TOM1 in the signaling pathways induced in response to LPS and lipopeptide, and we link this observation with regulation of TOM1 by miR-126. Together, these data show that miRNA can be differentially expressed in CF airway epithelium and may regulate pulmonary inflammation in CF. Expression profiling studies have identified altered miRNA expression patterns in a variety of human diseases. A number of miRNAs are routinely under- or over-expressed in a variety of tumors (e.g., miR-34a, miR-143, miR-145, miR-21) (24–26). Several miRNAs are also differentially expressed in specific types of cancers (26, 27). However, there is also increasing evidence for important roles for miRNAs in regulating innate immunity (28–30). We hypothesized that unique miRNA expression profiles exist in CF versus non-CF bronchial epithelial cells and that these differential molecular miRNA signatures can regulate proinflammatory gene expression. This thesis held true for miR-126, which was decreased in CF versus non-CF bronchial epithelial cells, but also identified miRNAs that are not differentially expressed. Expression of miR-126 was consistently and reproducibly decreased in CF versus non-CF airway epithelial cells and correlated with a reciprocal increase in expression of its predicted target TOM1 both in vivo and in vitro. Although we found miR-126 overexpression decreased production of luciferase from a reporter gene regulated by the 3′UTR of TOM1, this conflicts with another report that failed to demonstrate regulation of TOM1 by miR-126 (9). Notably, however, we cloned the entire TOM1 3′UTR, rather than smaller fragments, into our reporter system—an approach that Kuhn et al. (31) have highlighted as being important for validation purposes. Since our initial in silico analysis, which indicated that TOM1 was targeted by miR-126 alone, Targetscan 5.1 now lists an additional 58 miRNA families that can target TOM1 (including miR-126). Of these, 23 were not analyzed in our expression profiling and 19 were not detected in any sample; of the remaining 16, miR-126 was the only one to be significantly decreased in four of the five CF samples. Although the relatively small patient numbers used for the expression profiling may be considered a limitation of this study, we have subsequently replicated our observations regarding miR-126 and TOM1 in additional patient samples. Upon stimulation with IL-1β or LPS cells transiently transfected with a TOM1 overexpression, plasmid exhibited a reduction in NF-κB luciferase activity. This finding is consistent with a previous report that proposed TOM1 as a negative regulator of signaling pathways induced by IL-1β and TNF-α, whereby overexpression of TOM1 inhibited activity of the transcription factors NF-κB and AP-1 (17). Our work builds on this by showing that TOM1 can also negatively regulate signaling to NF-κB induced by LPS via TLR4. Our TOM1 knockdown studies corroborate this finding, showing a significant increase in secretion of the NF-κB regulated cytokine IL-8 in response to LPS or IL-1β and lipopeptide, thus introducing a role for TOM1 in TLR2 signaling. Other proinflammatory stimuli tested, which activate TLR3, 5, and 9, failed to elicit enhanced IL-8 secretion after TOM1 knockdown, consistent with reports of Tollip’s involvement solely in TLR 2 and 4 and IL-1RI signaling. To our knowledge, this report is the first on the involvement of TOM1 in the TLR2 and TLR4 signaling pathways. These findings extend our knowledge of TOM1 in regard to IL-1β and propose a new functional role for this protein in TLR2/4 signaling. Thus, regulation of TOM1 has important implications for the pulmonary inflammatory manifestations of CF and for other inflammatory diseases. We hypothesize that TOM1 may play an anti-inflammatory role in the CF lung and postulate that its increased expression may be an attempt to compensate for the high proinflammatory burden in this condition. We support this hypothesis by demonstrating significantly higher expression of TOM1 in vivo in bronchial brushings from CF versus non-CF individuals. The CF lung is a highly proinflammatory milieu. Bronchial epithelial cells are continuously exposed to multiple proinflammatory factors including neutrophil elastase, bacterial lipopeptides, LPS, flagellin, and uCpG DNA, among others (1). Furthermore ER stress associated with accumulation of misfolded CFTR is also likely to activate additional proinflammatory pathways (32). Interestingly, we have shown that ER stress actually contributes to downregulation of miR-126 with concomitant up regulation of TOM1. Our studies show that in CF bronchial epithelial cells, TOM1 provides a strong anti-inflammatory signal, which we believe represents a possible compensatory mechanism of addressing the chronic inflammation evident in CF. However, the anti-inflammatory effect of TOM1 in vivo, although important, may be overwhelmed because of the highly proinflammatory nature of the CF lung. TOM1 is known to form a complex with Tollip, and together they are responsible for the transport of ubiquitinated proteins to the endosome for degradation (33). IL-1RI is a substrate of the TOM1-Tollip complex, and its passage to the endosome is facilitated by this complex (9). In a study by Hauber et al. (34), comparison of TLR4 levels in endobronchial biopsies from CF patients and healthy controls revealed a significant reduction of TLR4 and to a lesser extent TLR2 in the CF samples. In a more recent study CFBE41o– cells have also been shown to exhibit lower surface expression of TLR4, compared with a CFTR corrected counterpart (wild-type CFTR plasmid transfectant). The authors suggest that this may contribute to the aberrant immune response evident in CF, resulting in chronic bacterial infection of the CF airway owing to decreased IL-8 secretion as a result of diminished TLR4 expression followed by delayed neutrophil chemotaxis (35). 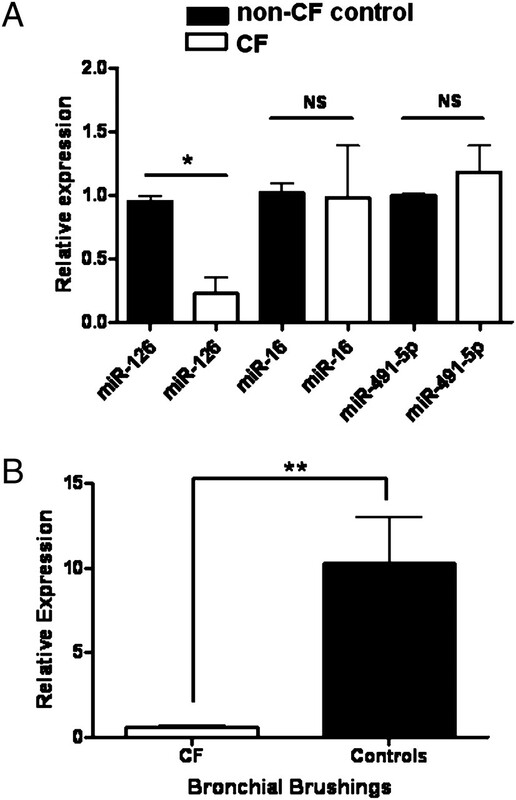 We show that miR-126 may be regulated by ER stress, and in CF airway epithelial cells lower levels of miR-126 are concomitant with increased TOM1 expression. Thus, it may be that the TOM1-Tollip complex, in addition to regulating IL-1RI expression, also modulates cell surface expression of TLR2/4 by a similar mechanism adding to this impaired immune response. Currently, one of the burning questions in this field is what regulates miRNAs? Expression of miR-146a, for example, is driven by NF-κB (36, 37). We evaluated the effect of LPS and IL-1β on induction of miR-126 in both CF and non-CF bronchial epithelial cell lines; however, no significant changes were observed with either stimuli. In human bronchial epithelial cells stimulated with the ER stress inducing agonist thapsigargin, we saw a marked reduction in miR-126 expression after 24 h. There was no effect on miR-126 expression levels at 4 h, and similarly CFTRinh-172 did not have any effect on miR-126 in these cells, suggesting that miR-126 may be regulated by chronic ER stress as seen in CF. Harris et al. (6) reported that TNF-α had no effect on expression of miR-126 in a recent study investigating regulation of VCAM1 by miR-126. However, similar to our study they proposed a regulatory role for miR-126 in inflammation, specifically in the vasculature. Saito et al. (12) have recently reported that downregulation of miR-126 can be induced by inhibitors of DNA methylation and histone deacetylation. To our knowledge, it is clear that miRNAs have an important role in the regulation of innate immunity (28, 30, 38–41). For example, miR-181a and miR-223 are implicated in establishing and maintaining the cell fate of immune cells (42), miR-146 is involved in innate immunity by regulating TLR signaling (37). Rodriguez et al. (43) highlighted the importance of miR-155 in maintenance of a normal immune response, whereas miR-181a has a role in regulation of TCR signaling (44). Altered expression of miR-203 and miR-146 has been shown in the chronic inflammatory skin condition psoriasis, suggesting their involvement in immune-mediated diseases (45). In light of our findings, it is appropriate to add miR-126 to the growing list of miRNAs with a role in fine-tuning innate immune responses. In summary, we describe for the first time miRNA involvement within CF. In particular, we identify altered expression of miR-126, a negative regulator of TOM1, in bronchial epithelial cells. Although miR-126 is decreased in CF bronchial epithelium in vivo, making it difficult to target, identifying miRNAs that are overexpressed in CF airway epithelium could lead to therapeutic targets that can be manipulated more easily. However, we believe that these findings have important implications regarding regulation of innate immune responses in the CF lung, which may effect anti-inflammatory therapies currently under investigation for CF and help lead to better management of the disease. Future work on other differentially expressed miRNAs identified in our expression profiling studies will likely yield additional new therapeutic targets for CF. We thank Dr. K. Nakayama (Kyoto University) for providing the pTOM1-Myc vector; Prof. D. Gruenert (University of Vermont, Burlington, VT) for the CFTE29o–, CFBE41o–, 16HBE14o– and 9HTEo-cell lines; and Dr. S. Smith (Trinity College Dublin, Dublin, Ireland) for help with the sequencing of pMIR-TOM1-3′UTR. This work was supported by the Children’s Medical & Research Foundation. ↵1 N.G.M. and C.M.G. share joint senior authorship.
. 2005. Viral inhibition of IL-1- and neutrophil elastase-induced inflammatory responses in bronchial epithelial cells. J. Immunol. 175: 7594–7601. 2008. Control of protein synthesis and mRNA degradation by microRNAs. Curr. Opin. Cell Biol. 20: 214–221.
. 2008. Molecular biology: the expanding world of small RNAs. Nature 451: 414–416.
. 2005. Microarray profiling of microRNAs reveals frequent coexpression with neighboring miRNAs and host genes. RNA 11: 241–247.
. 2008. MicroRNA-126 regulates endothelial expression of vascular cell adhesion molecule 1. Proc. Natl. Acad. Sci. USA 105: 1516–1521.
. 2007. Identification of rat lung-specific microRNAs by micoRNA microarray: valuable discoveries for the facilitation of lung research. BMC Genomics 8: 29.
. 2008. MicroRNA-126 inhibits invasion in non-small cell lung carcinoma cell lines. Biochem. Biophys. Res. Commun. 373: 607–612.
. 2008. The cell growth suppressor, mir-126, targets IRS-1. Biochem. Biophys. Res. Commun. 377: 136–140.
. 2008. miR-126 regulates angiogenic signaling and vascular integrity. Dev. Cell 15: 272–284.
. 2008. The endothelial-specific microRNA miR-126 governs vascular integrity and angiogenesis. Dev. Cell 15: 261–271.
. 2009. Epigenetic therapy upregulates the tumor suppressor microRNA-126 and its host gene EGFL7 in human cancer cells. Biochem. Biophys. Res. Commun. 379: 726–731.
. 2008. Endogenous human microRNAs that suppress breast cancer metastasis. Nature 451: 147–152.
. 2003. Tom1, a VHS domain-containing protein, interacts with tollip, ubiquitin, and clathrin. J. Biol. Chem. 278: 52865–52872.
. 2004. Tollip and Tom1 form a complex and recruit ubiquitin-conjugated proteins onto early endosomes. J. Biol. Chem. 279: 24435–24443.
. 2006. Intracellular trafficking of interleukin-1 receptor I requires Tollip. Curr. Biol. 16: 2265–2270.
. 2004. Tom1 (target of Myb 1) is a novel negative regulator of interleukin-1- and tumor necrosis factor-induced signaling pathways. Biol. Pharm. Bull. 27: 564–566.
. 2008. High-throughput stem-loop RT-qPCR miRNA expression profiling using minute amounts of input RNA. Nucleic Acids Res. 36: e143.
. 2009. A novel and universal method for microRNA RT-qPCR data normalization. Genome Biol. 10: R64.
. 2009. MiR-126 restoration down-regulate VEGF and inhibit the growth of lung cancer cell lines in vitro and in vivo. Lung Cancer 66: 169–175.
. 2009. Predicting microRNA targets and functions: traps for the unwary. Nat. Methods 6: 397–398.
. 2006. MicroRNAs 143 and 145 are possible common onco-microRNAs in human cancers. Oncol. Rep. 16: 845–850.
. 2006. A microRNA expression signature of human solid tumors defines cancer gene targets. Proc. Natl. Acad. Sci. U.S.A. 103: 2257–2261.
. 2007. MicroRNA-34a functions as a potential tumor suppressor by inducing apoptosis in neuroblastoma cells. Oncogene 26: 5017–5022.
. 2007. Differential patterns of microRNA expression in neuroblastoma are correlated with prognosis, differentiation, and apoptosis. Cancer Res. 67: 976–983.
. 2008. MicroRNAs and immunity: novel players in the regulation of normal immune function and inflammation. Semin. Cancer Biol. 18: 131–140.
. 2008. Experimental validation of miRNA targets. Methods 44: 47–54.
. 2008. From endoplasmic-reticulum stress to the inflammatory response. Nature 454: 455–462.
. 2006. Recruitment of clathrin onto endosomes by the Tom1-Tollip complex. Biochem. Biophys. Res. Commun. 341: 143–149.
. 2005. Toll-like receptors 4 and 2 expression in the bronchial mucosa of patients with cystic fibrosis. Can. Respir. J. 12: 13–18.
. 2009. Toll-like Receptor (TLR)-4 Mediated Innate Immunity is Reduced in Cystic Fibrosis Airway Cells. Am. J. Respir. Cell Mol. Biol.
. 2008. Rapid changes in microRNA-146a expression negatively regulate the IL-1β-induced inflammatory response in human lung alveolar epithelial cells. J. Immunol. 180: 5689–5698.
. 2006. NF-kappaB-dependent induction of microRNA miR-146, an inhibitor targeted to signaling proteins of innate immune responses. Proc. Natl. Acad. Sci. U.S.A. 103: 12481–12486.
. 2007. MicroRNAs and immunity: tiny players in a big field. Immunity 26: 133–137.
. 2009. Integrating the MicroRNome into the study of lung disease. Am. J. Respir. Crit. Care Med. 179: 4–10.
. 2008. MicroRNAs in the immune response. Cytokine 43: 391–394.
. 2004. MicroRNAs modulate hematopoietic lineage differentiation. Science 303: 83–86.
. 2007. MicroRNAs: novel regulators involved in the pathogenesis of Psoriasis? PLoS One 2: e610.